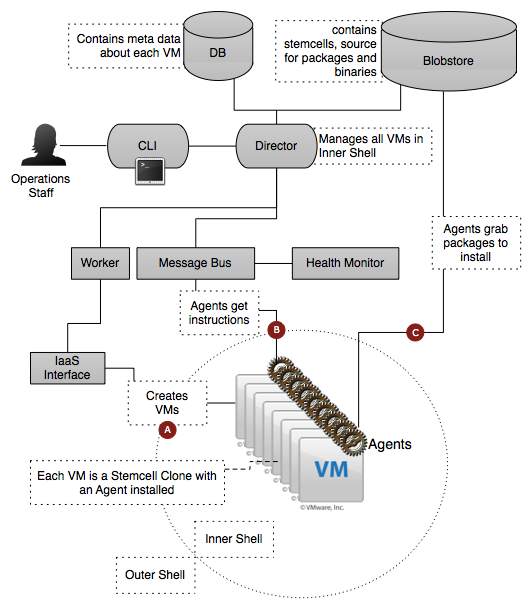 Over a year ago, I wrote my initial thoughts on VMware's CloudFoundry PaaS platform. Over the past year, the platform has grown and evolved in interesting ways - new frameworks, new partners, new tools and new ways to interact with the community. But one question continued to linger. How would CloudFoundry connect back to the rest of the VMware portfolio? There was already some connections to the SpringSource framework and vFabric, but it wasn't clear if it would connect back to vSphere. Or should it connect back to vSphere? Cloud Foundry is an open (source) PaaS framework that was designed to run on any cloud, so would it build the hooks to connect to ESX/ESXi or vCloud Director? For the 1st year, the answer was "no". No vSphere dependencies. But with the one year anniversary announcement, the CloudFoundry team introduced the BOSH tool chain. Within the BOSH framework is a concept called CPI (Cloud Provider Interface), which defined a way to interact with IaaS clouds. 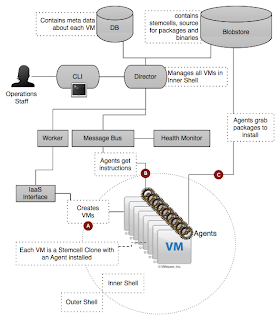 Included with BOSH were CPIs for VMware vSphere and Amazon AWS. This was inline with the CloudFoundry goal of being able to run on any cloud infrastructure. They picked the leading private and public cloud frameworks. And since Cloud Foundry is open-source, there is the potential that additional CPI's will be built for other cloud frameworks (CloudStack, OpenStack, Eucalyptus, XCP, etc.). Then things got sort of interesting. VMware CEO Paul Maritz was asked about the growing popularity of OpenStack, during the recent OpenStack conference and release of Essex. In diplomatic fashion, he stated that he's aware of OpenStack's growing momentum, but didn't consider it as mature as vSphere. Fair comments and analysis. VMware had previously made some public comments about the recent API arguments between various open-source cloud projects. But during the OpenStack developers conference, the CloudFoundry team held a public hackathon to create ways to integrate the two projects. Out of that event came some initial work from Piston Cloud to create a BOSH CPI for OpenStack. At this point, some interesting intra-vendor and inter-community strategies are in play. But for companies looking to deploy cloud computing to solve business challenges, it potentially introduces an interesting question - should they be looking at the same frameworks they used to virtualize the existing applications as they will use to deploy new applications or cloud environments? I've explored this question a couple times before (here and here). In a perfect world, companies would be able to seamlessly integrate the old and new, with a smooth transition from one operating model to another. But it's been highlighted by multiple experts (company, vendor) that this is far from reality. So will we see the forward-looking companies bi-furcating their architectures that deal with the diverse requirements of existing applications and new applications to support mobile devices or CoIT demands? And if they do, will they look to extend their existing cloud frameworks, or look to more open models based on stacks like CloudFoundry (PaaS) + OpenStack? Will new devices, user-expectations or community models be the catalyst for companies to change how they've operated IT for the past 5 years or 25 years? As we're sitting in Cloud Computing conferences in 2013 or 2014, will the panels be filled with companies quoting Robert Frost?